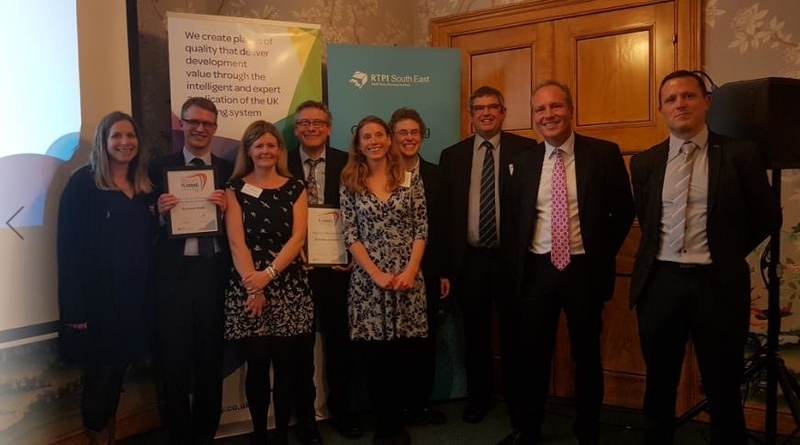 On Thursday 22nd November the Solent based conservation partnership, Bird Aware, were thrilled to be presented with two awards at the respected Royal Town Planning Institute (RTPI) South East annual awards ceremony held at the Royal Brighton Pavilion. The first award was presented in the category, ‘excellence in planning for the natural environment’. Awarded for recognition of work that helps to protect iconic bird species such as the curlew and the brent goose. To the delight of the team the accolades didn’t end there. The partnership, made up of 15 local authorities and four conservation groups, also picked up the prestigious award for overall regional winner. This was awarded for the strong collaboration work it has nurtured between the partners, which has helped to ensure that challenges have been overcome and the important environmental messages were conveyed. Bird Aware is an initiative that raises awareness of birds that spend the winter on the Solent coast, so people can continue to enjoy the internationally protected area without disturbing the wildfowl and waders. Information is predominantly voiced by a team of rangers that tour the Solent engaging with walkers and other users of the coast about the plight of the birds and their migration journeys. Bird Aware is a partnership that is vital for the future of our birds that spend the winter here. It is an important organisation for the local community and economy, so I’m thrilled that it got the acknowledgement it deserves with these two awards. I’m really pleased for everyone involved and very excited for what the future holds. The Bird Aware Solent project provides special protection for overwintering birds on the Solent coastline, following concerns from natural environment experts about human disturbance to the wildlife. Led by Bird Aware Solent and through strong collaboration across several local authorities, the project provided a crucial response to protecting the birds whilst enabling continued residential development and open access to the coastline for visitors. It is wonderful to celebrate the role that planners will continue to do in delivering prosperous places for both communities and wildlife alike. Bird Aware Solent has been recognised as an exemplary method of engaging with users of the coast by the government’s adviser for the natural environment, Natural England. The partnership is currently seeking to expand its public engagement via similar environmental groups around the UK.